The Four Seasons The Westcliff in Johannesburg reopened in early December 2014 after nearly a year of renovations and refurbishments. I was very lucky to be one of the first guests to experience the hotel after reopening. After an incredible two week trip that took me all over South Africa and Zimbabwe, I checked into this classic urban retreat a little road weary and more than ready for a quiet moment to digest everything I saw and learned on the trip. The Westcliff was the perfect setting and I was lucky to have incredible sunny weather. 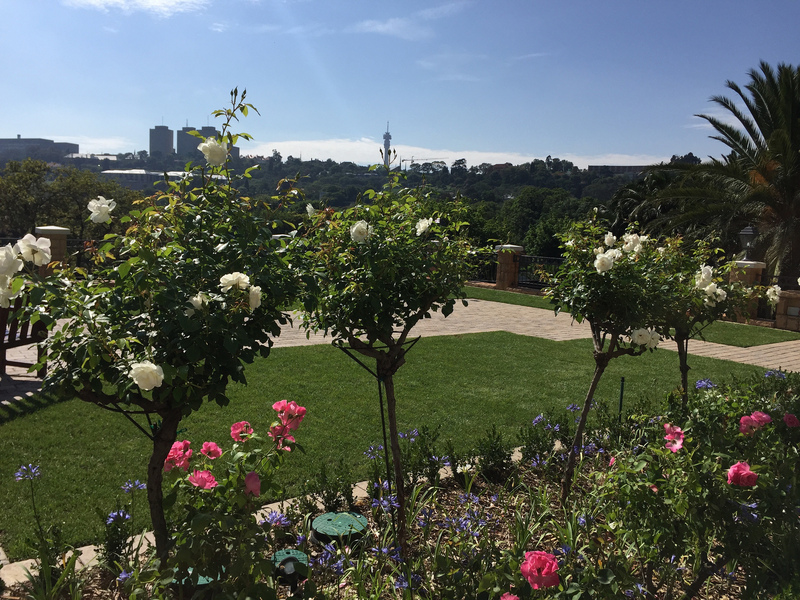 I spent the morning wandering around the well manicured lawns and gardens and enjoying the incredible views of Johannesburg at breakfast. Then, I retreated to my room decorated with playful zebra wallpaper and I became a hermit for a day. I think the best test of a good hotel room is to see if it is truly comfortable to keep you happy for a whole day without leaving! The hotel is still very new and, as expected, they had a few kinks to work out. The check-in process was a little slow as the front desk attendant tried to figure out which paperwork she needed. My room didn’t have a “do not disturb” placard for the door. The servers at breakfast were clearly still learning about the items on the menu. … You get the idea. But, all of these issues are easily remedied by time and I trust the Four Seasons will be spending quite a bit of energy this year making sure everything is up to standards. The views are incredible! Generally, I prefer to have breakfast in my room when I’m traveling, but this is one hotel where I would insist on eating at the restaurant. 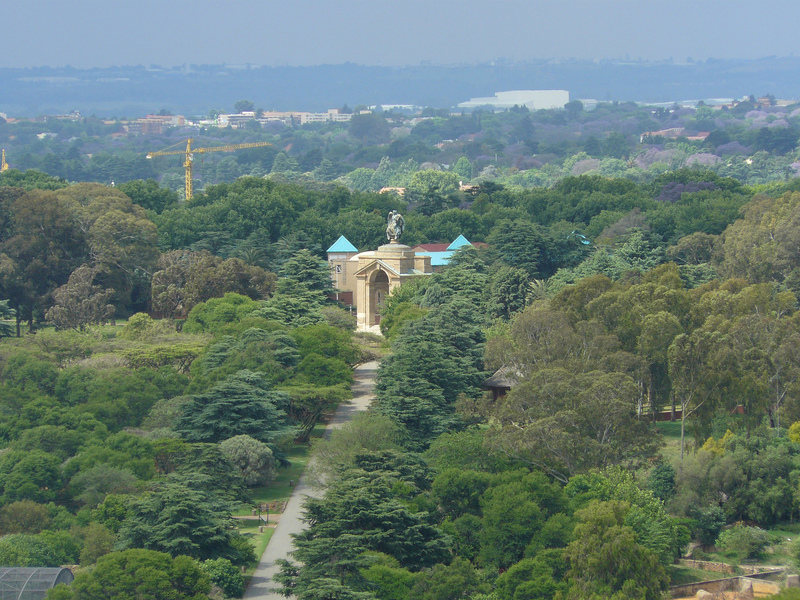 These views are unmatched; it feels like you are floating above all of Johannesburg. I stayed in a Premier Room and I toured a Superior Room as well as a 1-bedroom Suite. The rooms are all large and smartly decorated and many have balconies. 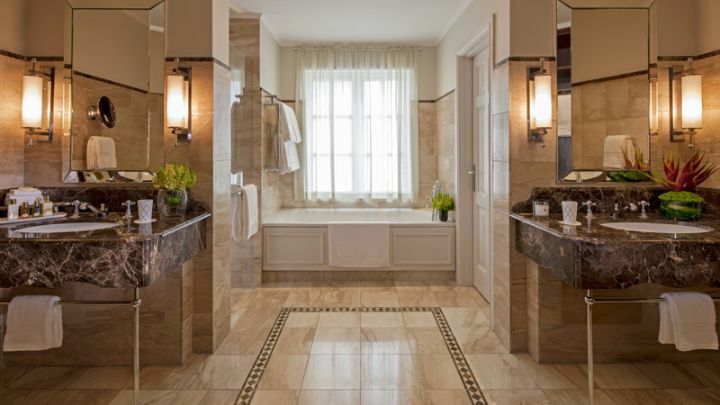 My favorite room feature is the bathroom layout, which has with two vanities and two closets. These bathrooms make it very easy to stay organized and I appreciated the opportunity to spread out all of my clothes and toiletries after living out of a small duffel bag for two weeks! I do wish this hotel offered complimentary laundry service like its competitor, The Saxon. That service was sorely missed as I was doing laundry in my sink trying to make sure I had enough clean clothes for my long flight home! At Four Seasons The Westcliff, the grounds are laid out a bit unconventionally; rooms are scattered throughout smaller, townhouse-like buildings built into a hillside. Beautiful courtyards with bubbling fountains dot the property and offer little secret gardens for exploring and relaxing. Most guests opt to take rides on the golf cart shuttles up the hill and then enjoy leisurely walks through the gardens to get back down. The restaurant has a clever elevator up the hillside, which also helps to eliminate having to walk up the hill for dinner. All of this has the added advantage of giving the hotel a resort feel and it is easy to forget that you are an easy car ride to shopping and dining in Pankhurst, Braamfontein, and many other bustling Johannesburg neighborhoods. As is always the case with my travels to South Africa, I can’t wait to return and I have no doubt that the Four Seasons The Westcliff will be on my future itineraries! This entry was posted in Africa/Safari, Hotel Reviews and tagged Four Seasons, Hotel, hotel review, South Africa. Bookmark the permalink.